Every year in our home the advent of the Christmas season begins with a war. It is an epic battle between our daughter and son. My husband brings up the holiday decoration boxes from the crawl space and the kids rush to find the box with the nutcrackers. Over the years “Santa” has brought the children nutcrackers of all sorts–girls and boys alike. We have ballerinas, angels, warriors, elves, firemen, and bakers to name a few. 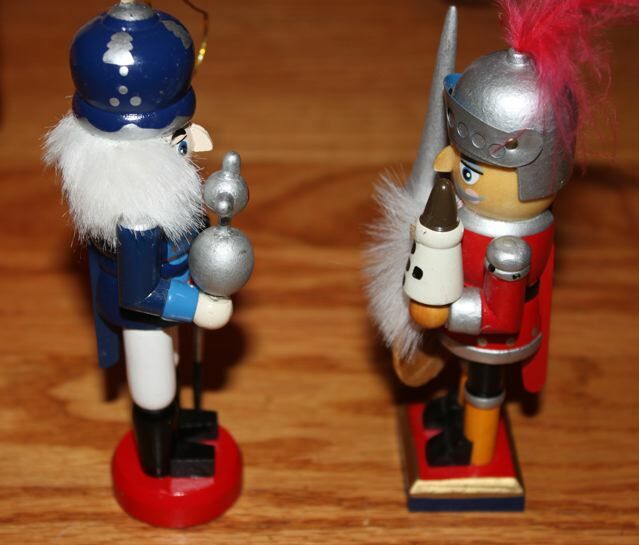 Additionally I have little nutcracker ornaments as well. 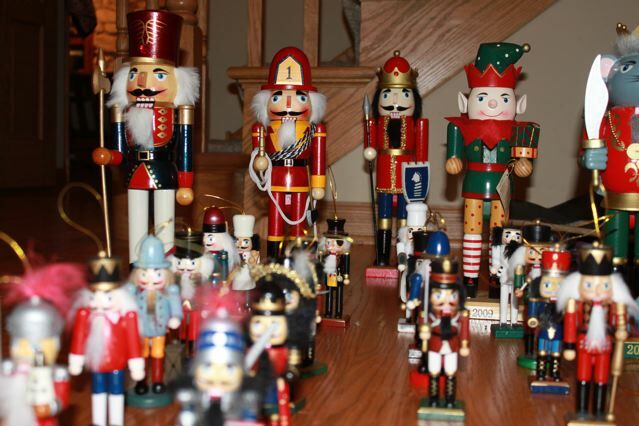 The kids open all the ornaments and pull out the giant nutcrackers and set up the battlefield with the large nutcrackers as generals in the back and the small ones as their army. Play by play, nutcrackers lie dead on the floor until the children declare the game over or I get fed up and ask them to clean up the battlefield so we can sweep the floor. Some of us battle the Holiday Blues every year. The “magic” of the holidays have not yet hit our home. Our kids are getting older, my mom was just discharged from the hospital after four months, and we have not yet gotten our Christmas tree. It is not always easy to put on “holiday cheer” this time of year. There are those of us who walk around in a daze wondering why the magic of the season doesn’t work on us. Many of us suffer from the Christmas blues. It is no wonder that we have the “blues” when so much of the popular holiday experience is based on what we will consume–eat and buy, give and get. Much of our activities at this time of year are all about staging a picture perfect moment when our loved one will open our gift. We want to see tears of joy, squeals of laughter, and furious excitement as the day unfolds. And yet the holiday fails to deliver us joy. Perhaps we have failed the holiday. Maybe it is time to go a little deeper–to move beyond the birth of the baby in the manger and the gifts of the wise men. Our holiday blues are a sign that we have matured, but that our ideas about Christmas and the holidays have not. Holiday blues are not new. All around us people have been suffering this time of year and have gone unnoticed by our eagerness to create the magic for our kids and families. One year when our son was three months old, we took him on his first flight to see my mother and my granny–his grandmother and great-grandmother. On Christmas day my granny was brought to my sister’s home from the nursing home where she stayed. I was keen to have a photo of our baby with his two grandmothers. Granny was irritable. We were trying to stage a photo on the couch and I was having trouble getting everyone to cooperate. Our son was fussing, Granny did not want to sit up and hold him, and my mom was in the other room talking. We finally took the photo. I cherish it to this day, but not so much because it is of our baby and his two grandmothers. I cherish it because it was the last photo we have of my Granny alive. She died a month later catching us all by surprise. One scripture that keeps coming back to me this time of year is Isaiah 9. This is the scripture that Handel’s Messiah “For Unto to Us a Child is Born” is based. I was soprano in high school chorus and I still remember singing those lilting lines, “Wonderful, counselor, all mighty God, everlasting Father, Prince of Peace.” I can still hear the bass voices singing out, “And the government shall be upon his shoulders.” These famous lines come from verses 6 and 7 in chapter 9 of Isaiah. As Christians we say this scripture foretells the birth of Jesus as our messiah–anointed to save us from our sins. I believe that all the work we do on Christmas Eve for the Christmas morning surprises are attempts at recreating the awe and wonderment of that day when Mary delivered her first born son. Every year when we set up the nativity scene in our home we all lean in to see the baby Jesus in the manger. I wonder how we can “lean into” the holiday to get a better glimpse of Jesus this year? But how can we do that? In our home, every year we keep an Advent Wreath at our dining table. 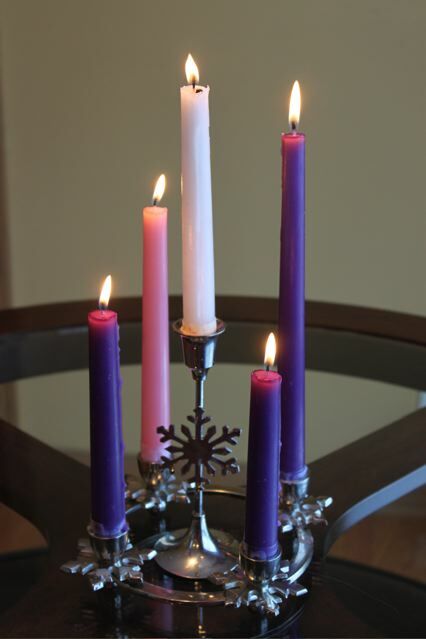 The candles represent the four weeks leading up to Christmas–Two purple candles for Hope, and Love. The pink candle is Joy, and the final purple candle is Peace. On Christmas Eve we light the white candle which is the Christ Candle–the light of our world. These candles are most magical when it is dark outside–before all the lights are turned on. It is in our darkest nights that the light in our life seems to shine the brightest. This is true of Isaiah 9 as well. When we go deeper we see that the baby was not born in good times. Isaiah says, “The people who have walked in darkness have seen a great light.” These people waiting for the light have suffered greatly. They have been oppressed, beaten down, and kept from seeing the goodness in their life. The light they see is the light of liberation–of freedom. Verse 5 is the one that intrigues me most, “all the boots of the trampling warriors and all the garments rolled in blood shall be burned in the fire.” This is an image of war when the battle is over. The image is of the marching boots of the conquering army coming upon the scene where many have been slain. Their clothes are covered in blood. Fires will be set to cleanse the area of the remains of war. It is a gruesome sight, and yet it is one of the most well read scriptures of the Christmas season. What can we learn from these people? The joy of the people in Isaiah 9 comes from the freedom they receive. They will no longer suffer from oppression. Their’s is not a joy from getting all they wanted, but receiving the freedom to live peacefully within their land. Maybe conquering the Holiday Blues means that we must learn to live peacefully within our own lands. Our own expectations may be our holiday oppressors. The consumer culture and the Santa surprises may be distracting us from seeking the Prince of Peace. 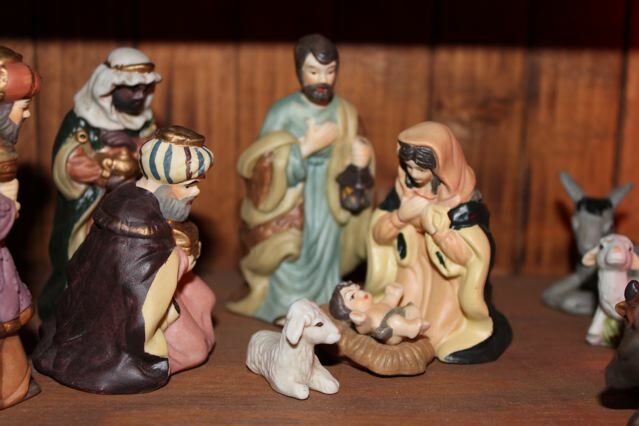 A humble Nativity Scene reminds to lean into the manger. When we experience the blues–the darkness within the holiday, it is an opportunity to lean in to the manger. The manger scene is a humble one. There is little around to celebrate with–no decorations, no elaborate meals, no gifts under a tree, just a few shepherds, some animals, a humble stable and the wonderment of a new life in the arms of his adoring parents. If you or someone you know is suffering from the holiday blues, cradle those blues tenderly–like a child just brought into this world. Take a look at them, go deeper. Perhaps you are grieving Christmas’s past. Maybe this year your budget doesn’t allow you to join into the gift giving in the same ways as before. Think of the holiday blues as a chance to get to know your inner self better and to let go of the battles you are fighting within your life. I wish you well this holiday season and pray you will find peace inside and out. Sweet words, my friend. And don’t forget that not everyone celebrates the same holiday — the importance of bringing light to ALL who suffer, not just the Christian ones. Blessings on you and your family — thank you for sharing your light and love out into the world! wow just straight from the heart so touching and yet full of reality.I enjoyed reading and felt like something I can relate to.